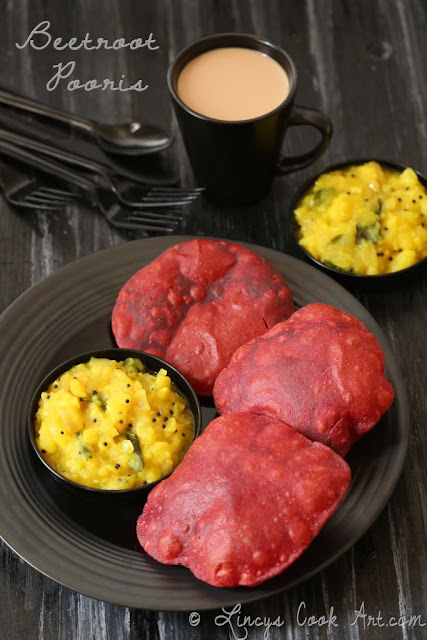 Beetroot Pooris (or) Pink Pooris/ Puri is a normal poori with a healthy twist on it by using beetroot. This makes the pooris little healthy, more colourful, kid friendly and attractive. I have shared many beetroot recipes in my blog in various categories from starter Beetroot cutlets, Beeting heart Deviled eggs, Beetroot Masal Vadai as a snack, Beetroot Masala Dosa, Beetroot Dosa as a breakfast, Beetroot Chocolate Cake as a dessert, ABC juice as a Health drink and Kerala Beetroot Pachadi as a side dish for rice. I have some more beet recipes and post when i get time. Stay tuned! Peel and finely chop the beetroot. Keep inside a blender jar and grind to make a fine paste with little water (less than 1/4 cup of water). In a mixing bowl add the semolina and drizzle little water or beetroot juice to soak it up for 5 minutes. If you use water drain the water, if any stagnates on top after 5 minutes. Add the whole wheat flour, oil, salt and the ground beet root puree to mix well with hand. Knead well to make a dough. As the dough should be soft enough, so add enough beetroot puree to make it soft and pliable dough. If the dough is hard while frying cracks will form and tastes dry, also the pooris wouldn't be soft enough. You could use only beetroot juice(use half a cup of water and grind the beetroot and roughly squeeze using hands to get the juice if some beetroot puree falls also makes any difference. If you need to perfectly extract the juice, use a strainer) to get deep purple coloured pooris. Once the poori try to pop up from the oil slightly press the poori downwards using a slotted spoon to make the poori to puff them up completely. Flip the pooris and cook the other side too and drain from oil and keep on top kitchen towl to drain excess oil. Notes: You could pressure cook the beetroots and make the puree for the pooris. But i prefer to use it as raw to avoid nutrient loss. You could pressure cook with potatoes when you cook potatoes for Poori masala. You could flavour the pooris with ajwain. You could add a teaspoon of chilli powder too if you wish. I have added extra 1/2 tablespoon of semolina for this poori to prevent the pooris getting soft due to the addition of beetroot puree. Colorful healthy pooris.. Looks so yum..